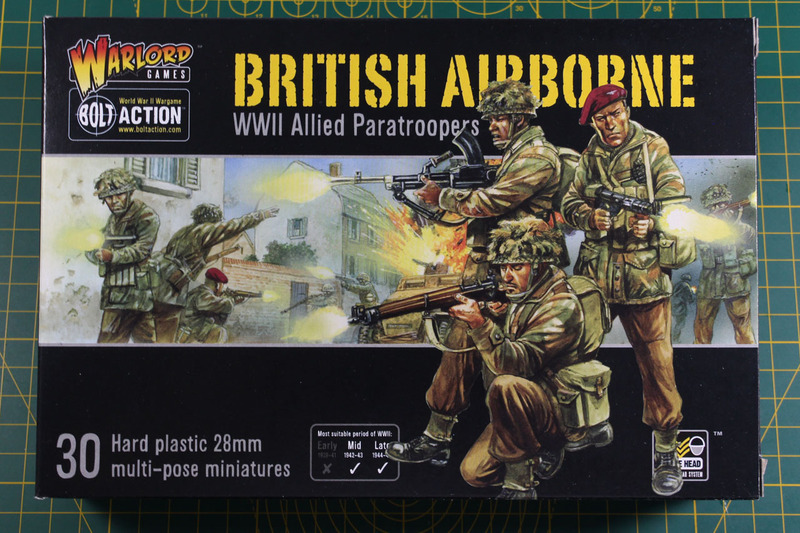 One of the latest kits and the youngest of the paratrooper plastic kits, are the British Airborne. 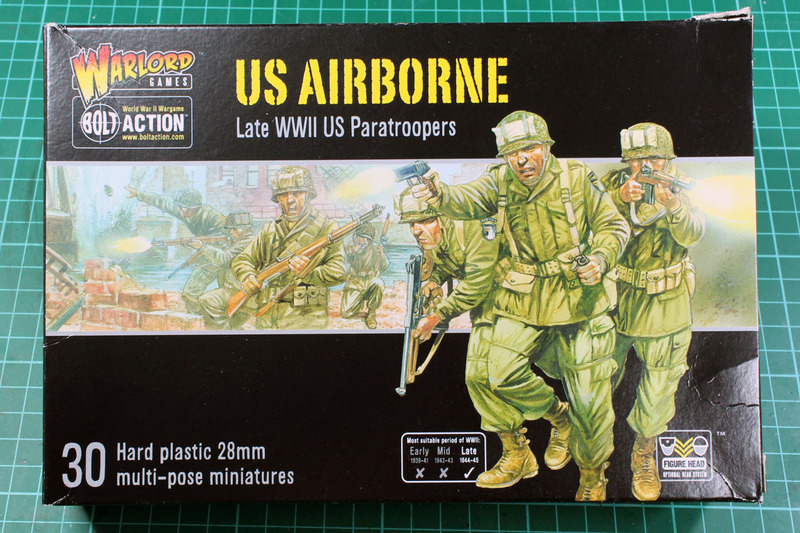 A must for this week's series of reviews around the Operation Market Garden along with yesterday's US Airborne kit. The British airborne is one of the many special combat divisions of the commonwealth's armed forces. They were founded in 1941, roughly a year earlier than their US American counterpart, and the 1st Airborne Division was send to North Africa for Operation Torch. But this kit covers the Red Devils in their North Western European gear, making them the best fit for the mid to late war operations of Pegasus Bridge, Operation Market Garden and the late fights crossing the Rhine / Operation Varsity, the largest airborne operation in history. In cinema the British paratroopers are mostly known from A bridge too far. 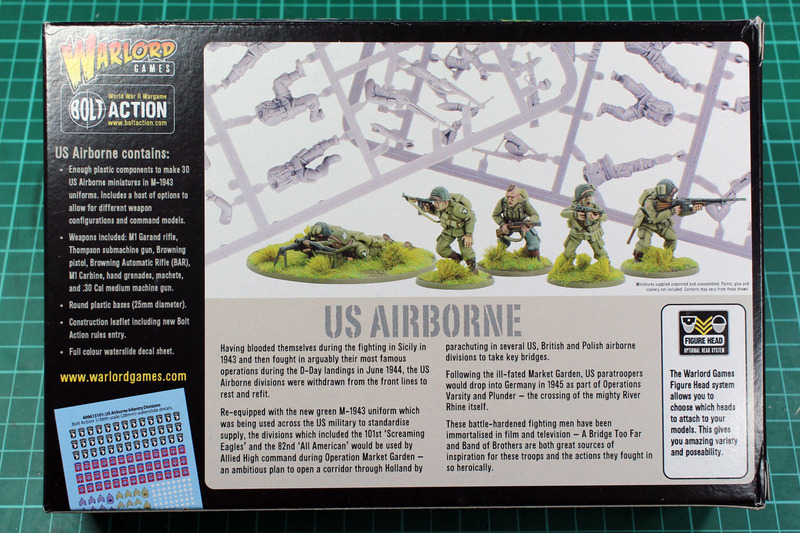 After we started the themed week with the supplement Campaign Market Garden, it is time to introduce and cover the matching Airborne units in a review - starting with the US Airborne. They were the second paratrooper unit released in plastic after the German Fallschirmjäger. The US Airborne was founded more or less in 1942, when the 82nd Infantry Division was renamed 82nd Airborne Division, regrouped and assigned a new task, Operation Husky, the airborne landing in Sicily, Italy. The 82nd Airborne are along with the 101st Airborne Division the only airborne division of the American forces, and both took part in Operation Overlord (D-Day / Landing in the Normandy) and Operation Market Garden. US Airborne soldiers were heroically represented in movies like Band of Brothers or Saving Private Ryan. 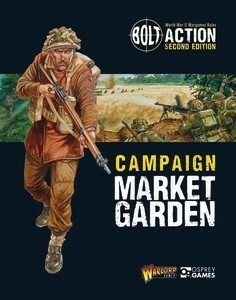 After covering the battles in the Pacific, the Eastern front and the Ardennes, the next Bolt Action supplement moves to North Western Europe with Campaign Market Garden. An instead of whole years of war, this battle has its eye on very intense 9 days in late September '44. 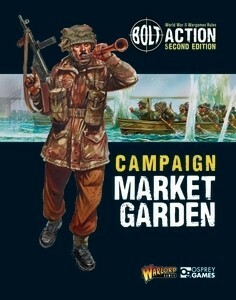 This campaign supplement covers the story of Operation Market Garden, the unsuccessful allied military attempt to take 9 bridges along the Dutch-German border. The military operations between September 17th and 25th are covered on 116 pages. Warlord Games charges the usual 19.99 GBP or 30 USD for the book, which is roughly 25 EUR. I've covered both the final cover (left) and the early cover (right) in the first row of pictures. We've often seen changes in the artwork between the first announcement and later publication; it was similar with The Road to Berlin and Campaign New Guinea. 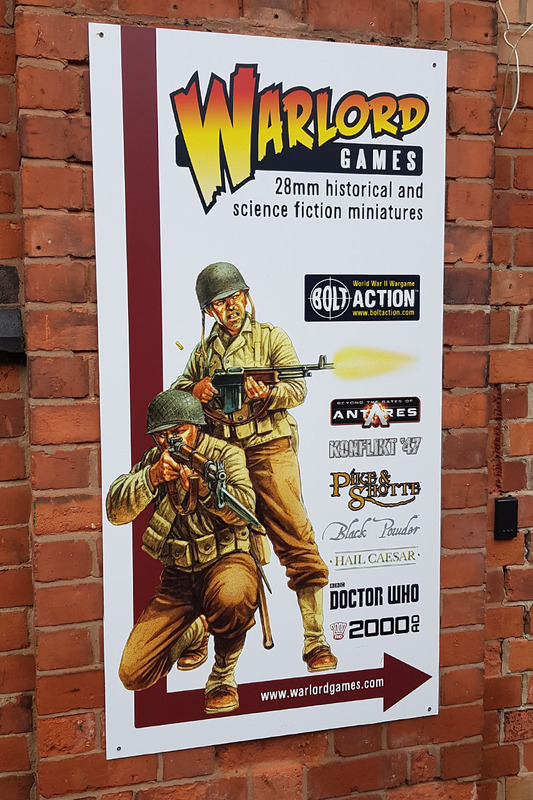 After visiting Mantic Games, we went to Warlord Games, to take a look at their new HQ store. 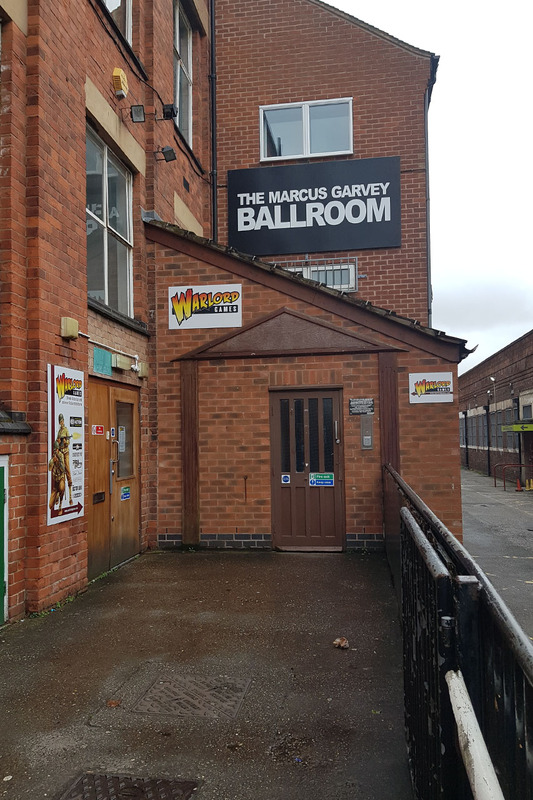 Warlord has been located at Lenton Business Centre since the very beginning. Back when they only had a few offices, spread all over the complex, nowadays the have entire wings of the centre to their name. They held their first Warlord Games Day in 2013 there as well. 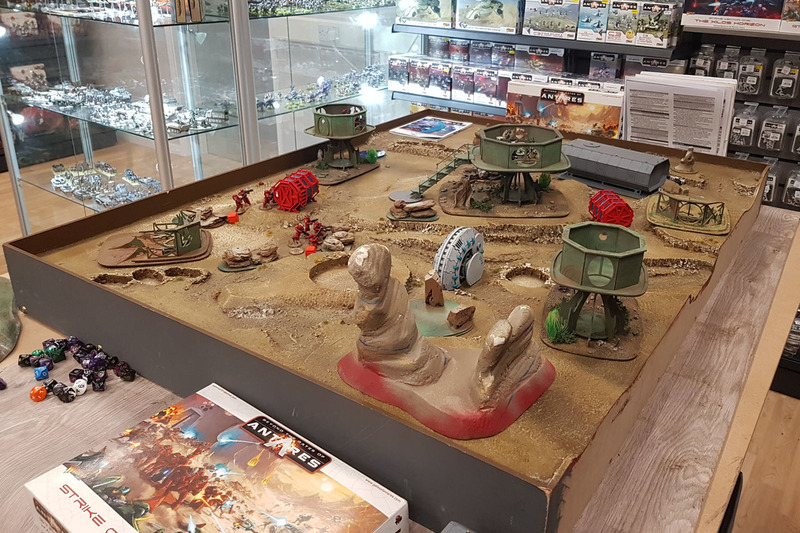 As the studio and production facilities are only open to the public during their open days or special occasions, the store is a new addition that is open daily from 11 am to 5 pm, with the exception of gaming thurday til 8:30 pm and sunday til 4 pm. Connor is the one in charge of the store and master of the several gaming tables within it. You can have a match of any of Warlord Games system at the store with a pal or get a introduction game. 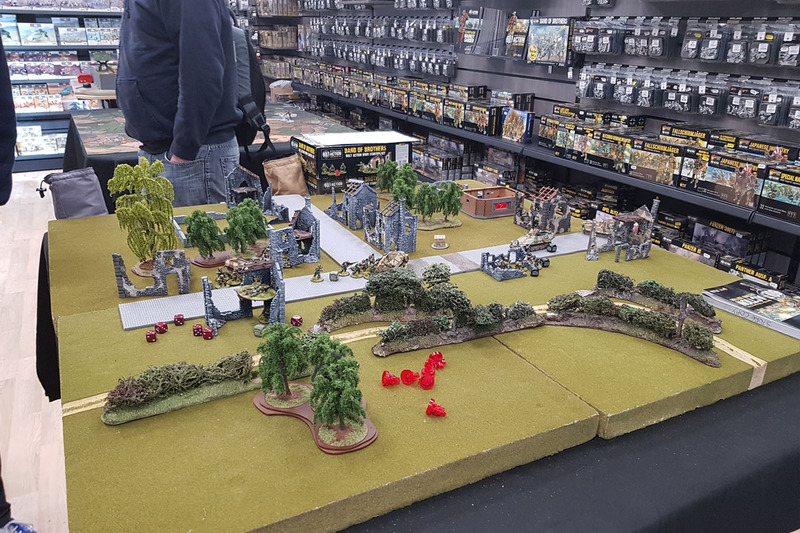 They even have the Pegasus Bridge set up at the store. Along with the previous introduced Chindits, there is need for suiting vehicular support. In Burma they used the nimble bren carriers to transport soldiers and goods, some of the universal carriers were fitted with a flamethrower and called Wasp, which I want to introduce in this review. Of the more than 110,000 units that were build of the universal carrier, roughly 1,000 units were manufactured as the wasp. 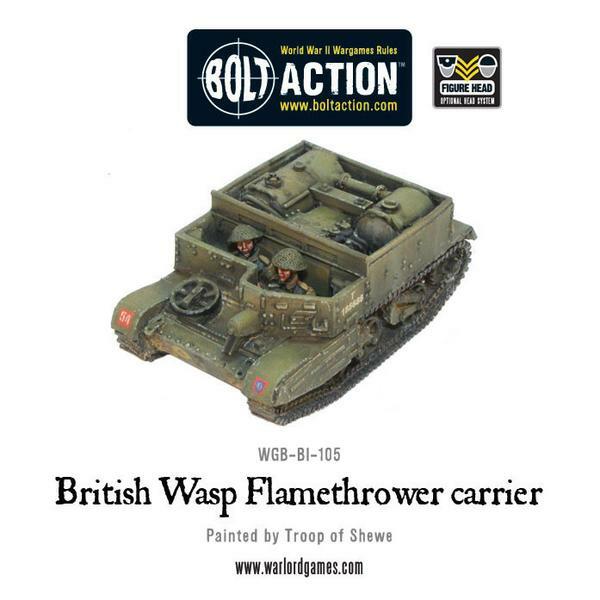 The wasp carried the Ronson flamethrower system, with the Mark I having it fixed in the front and the Mk II the projector on the co-driver's position. Both had two fuel tanks with a capacity of 100 gallons. The canadians developed the Mk IIC with a single 75 gallon fuel tank. As you can see from the product image, this is the Mark II of the wasp. 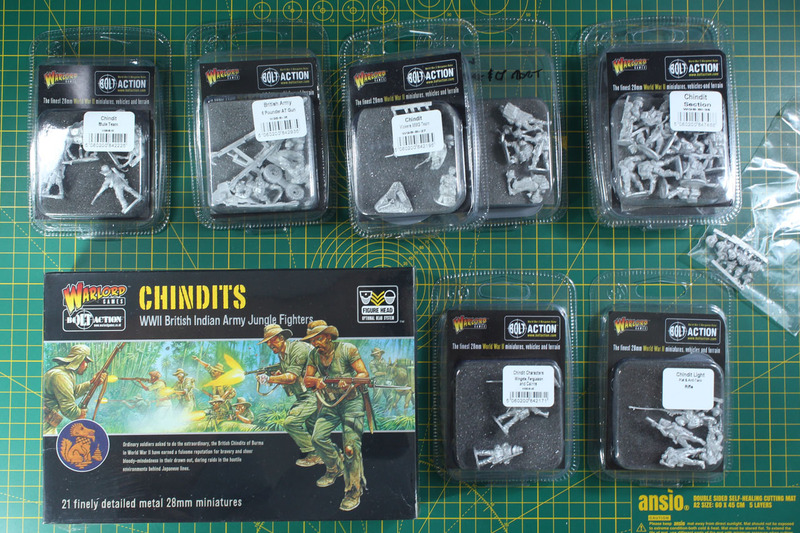 I have this lot of chindits lying around for quite some time now, and I want to explain why I chose these and what is the motivation behind it. First of all, why a themed army? I always liked from background to my projects, wether it is sourced ficitional or historical. I like to have a proper base to start from. A source to begin with, a common thread that combines the miniatures. And it doesn't matter, if it is sci-fi, fantasy or historical. Simply painting your marines blue like on the box, is less interesting to me, than to read the books and see for something that catches my eye. I have to go back in my arguments, back when I started wargaming, I played Warhammer Fantasy and 40k, like many others do or used to do. A regular army project was already an invest and a themed army would easily be something that would drive up the costs by at least 50%, as you had to gather specific bits and pieces for conversions etc. 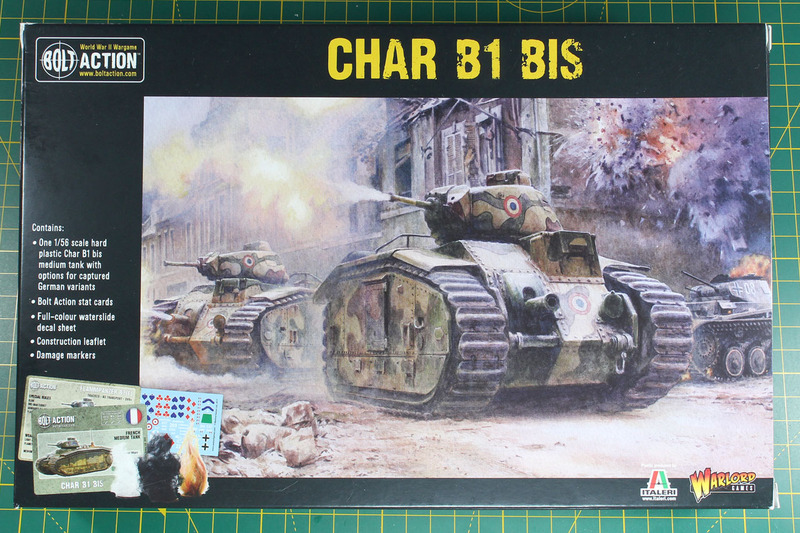 But historical wargaming is usually much cheaper, as there are more companies offering the same ranges. Exotic or themed armies can still be difficult or more costly, as in some cases only one or a few companies are covering specific nations or conflicts. In this case, as we're talking Bolt Action, we're talking World War II. The conflict is rather Euro-centric and most go for the elite or well known armies, US Airborne, Afrikakorps or something similar. You have battles between Americans, British or Russians on one side and Germans on the other. There is often not that much variation, as you more or less see the same armies. As with the armies I already have, different German forces, US American and British late war western front forces, those have broad vehicle pools, only a few limitations. So I looked for something far from home. I could have gone with the blue division (spanish volunteers on the eastern front), but that is more or less a regular german army with a minor different paint job. Along the campaign supplements for Bolt Action "Empire in Flames" was a very interesting read for me, as it showed that there many conflicts that lead to a global war scenario, beside the tension after World War 1, but I don't want to go into detail on that, I'll pick up the conflict in the pacific in the upcoming review on the Campaign: New Guinea. More interesting was for me this specific special army of the British in Burma. Warlord has these in their Bolt Action range and they were sculpted by the talented hands of Paul Hicks, so the miniatures had it easy to "lure" me in. 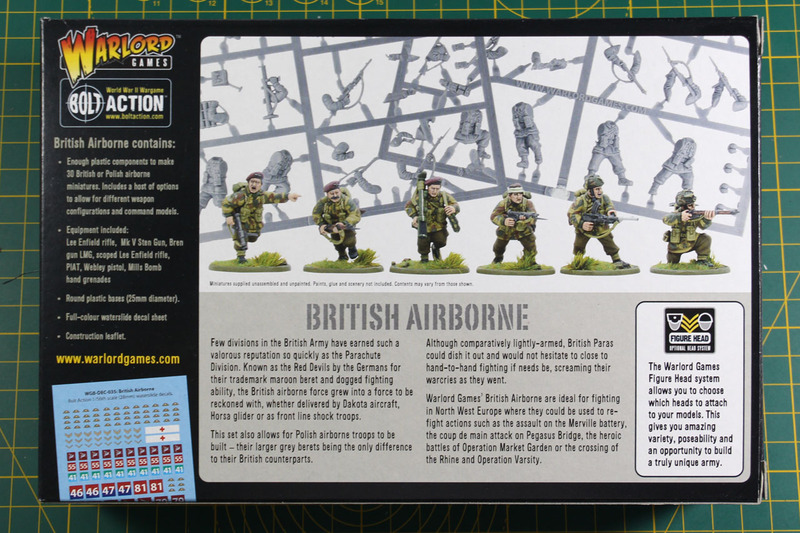 As the chindit range is entirely metal, it is spread across a couple of blister codes and a single larger box, with lots of different poses. I went more or less with ordering one of everything, as you can see below. And as we're talking Bolt Action, around 1,000 pts should be enough and not to costly. The StuG is done and here are the proper picture of the third vehicle for my Unternehmen Greif / Panzerbrigade 150 force for Bolt Action. 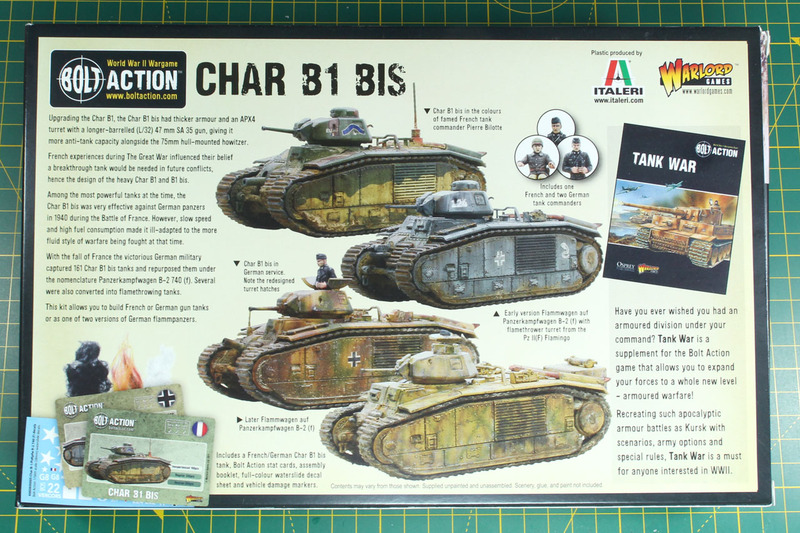 You can read about the work in progress in more detail over here, Ersatz Stug Ausf. G WIP. I thought a double sided Zeltbahn camouflage would be a nice detail for the vehicle. Went with winter / snow camouflage in "pure" white on the one side and a splitter tarn on the other side. There were reversible smocks for the infantry, proper details on the zeltbahn or vehicle netting are more difficult, so take this with some historical "liberty". 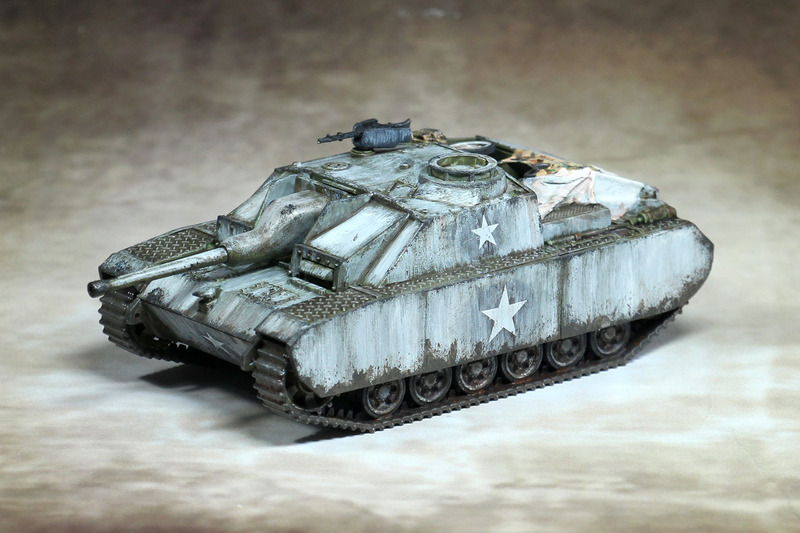 On the weekend I managed to do the last touches on the captured M8 Greyhound, named Ford M8(a) by the Germans. 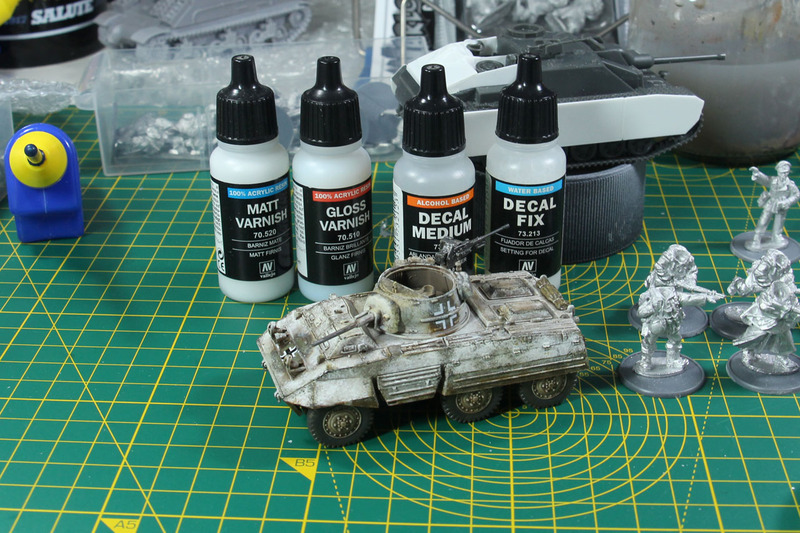 Applying the last few weathering bits and the fitting decals onto the vehicle. I used the Decal Fix and Medium by Vallejo, quite easy to use and the results speak for themself. Some suggest that you prepare the area with gloss varnish, I just used the Decal Medium, placed the decal and added a few thin coats of Decal Fix to soften the edges. Later "protect" the decal with matt varnish (and it dulls the decal a bit and makes it blend better with it surroundings).